The top 10 of promotional items sold by the Horizonsources Group in Europe. This top 10 was made according to criteria of originality, volume of sales and popularity among our customers. 10 years ago Chanel gave a new dimension to the temporary tattoos with its Chanel body jewels ! We are proud to say that it is the Horizonsources group which made these tattoos. The Nº 2 of this top 10 promotional items undeniably goes to the famous advertising silicone wristband. With printed or debossed messages. A large color choice, a perfect way to convey a message or slogan. Discover here the prices and printing possibilities of silicone wristbands. Advertising pens are already part of the best selling and used objects but the printed Shakespeare pens have undeniably a big advantage compared with the usual plastic pens. The printed Shakespeare pens are big, we can see very well the logo printed on the pen. 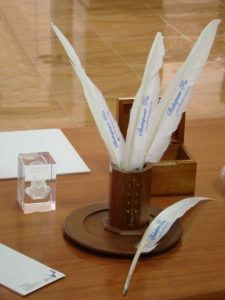 What is more, these Shakespeare pens are biodegradable. For more information and prices online: the website for printed featherpens. Here a surprising product in this top 10 of promotional items ! A colored pair of socks with the logo of your company or club. With these socks, you can imagine and create what you want. The logos and texts can be woven on the ankles but also under the sole of feet or on the top of the advertising sock. Discover the numerous possibilities and the prices on the advertising socks website. Nº5 The Weepuls or Logobugs ! The what ? Yes Weepuls, they are known, have different names such as Winnies, Logobugs, Wuppies but the most original is the WEEPUL ! Created 45 years ago in the United States by Tom Blundel, this small cuddly toy continues to convey logos, slogans on its small ribbon. Our subsidiary Weepuline in the USA is specialized in this product. Little teddy bear with self adhesive feet, rolling eyes and a printed ribbon. And yes !!! No advertising item gives so much visual impact for so few money ! 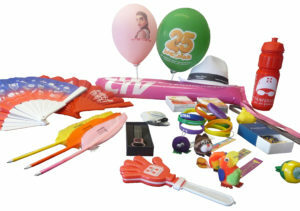 For about 0.10 Euros per piece, balloon printing included, you have a communication by the exceptional object. This product is used for any event, indoor or outdoor. We print millions a year. Visit the personalized balloon website for more information. Prices are directly online. Advertising car air fresheners and freshballs are among the rare advertising items that we can see in the car ! 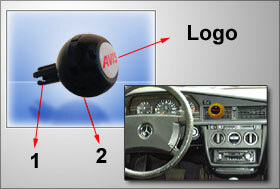 We offer both, the classic air freshener to hook it to the rear-view mirror and the freshball, unique car air freshener which clips into the aeration railings and diffuses the fragrance throughout the car. 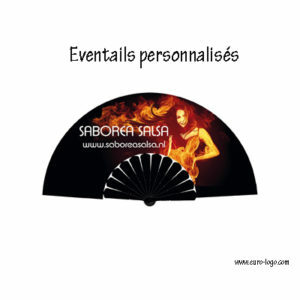 Personalized handfans are fashionable, typical Spanish product at first, it seduced the other European countries and became an advertising product which deserves its place in our top 10. We can print with a photo and you can choose the colors for the fabric and stick. An original item to be distributed in auditorium in summer. Came from silicone wristbands, this keychain is flexible, not heavy in the pocket and has a large communication surface ! You can even combine an order of silicone wristbands with these advertising silicone keyrings ! Yes, you know all the paperclips with their classic shapes but how about if you could give the shape of your choice to these paperclips ? A paperclip with the shape of a car, or with the shape of a house ? 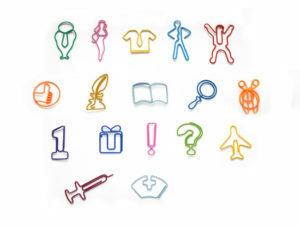 We have more than 200 different shapes and we can even create the paperclip with your own logo ! You didn’t find your happiness in this top 10 of promotional items? So contact us and we will help you to imagine, to realize and to make it. Contact our customer service by phone or by email, they will listen to you and they will be able to offer you other products more adapted to your event or your action !